The Mines & Wines conference presents geoscientists with technical case studies in exploration and mining, and the latest scientific advances in geology. The conference also provides students the opportunity to present their work, exchange ideas and share information with the broader community through the SMEDG sponsored student poster session. Any student submitting a poster will receive free entry to the conference and SMEDG is offering a prize pool of $500 to be awarded to the students are voted to have the poster with the best presentation and content. The subject matter for the posters should be related to their current studies. Student should speak to their supervisors if they wish to participate then register on the Mines & Wines website as a student poster. Registration includes delegate status at the conference and entry to the dinner, which is a good networking event. Additional student assistance can be sought for travel and accommodation through the state AIG branches, the Association of Mining and Exploration (AMEC) lucy.mcclean@amec.org.au or through Sandfire Resources who offer a bursary to support student education in honor of Louise Christie (Scholarships@sandfire.com.au). 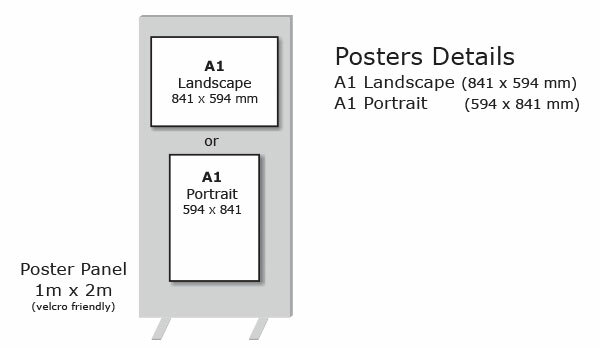 There is a maximum of 26 posters places available, and posters must be to a professional standard with appropriate content, text and graphics to the page sizes below.